For today’s edition of Bruins grades, we will be taking a look at two Bruins who had pretty underwhelming campaigns. It isn’t fair to call them disappointments given that expectation weren’t through the roof, but they still didn’t do enough to help the Bruins improve. Brian Gionta joined the Boston Bruins after Team USA’s elimination from the 2018 Olympic games in Pyeongchang. The team hoped he could be a depth piece to push them over the edge in the postseason, but his mediocre regular season play held him back from playing more than a single game in the postseason. I initially criticized the signing due to Gionta’s concerning level of play at the Olympics and my initial concerns now seem very valid. He was named the captain of the 2018 Olympic Men’s team, but he struggled mightily throughout the 2018 winter games. He only mustered up seven points during his 20 regular season games with the team and was unable to provide any consistent depth scoring or veteran leadership. I’m not going to pretend he was awful, but he certainly wasn’t good and didn’t do what the Bruins signed him for. Luckily his contract—one year, $700,000—was very reasonable and very low risk so it won’t hurt the Bruins long-term, but the 39-year-old was unfortunately unable to help the 2017-2018 team. While he may not have been very consistent, Anders Bjork got off to a solid start in 2017. He put up a lot of zeros on the stat sheet at the time, but he also flashed with some solid early games. What hurt the rookie forward’s season early on however were the unrealistic expectations. He may have been a star at Notre Dame, but he’s not ready to be a high-caliber NHL forward. Regardless, many thought he would be the third piece on the Brad Marchand, Patrice Bergeron line instead of David Pastrnak. 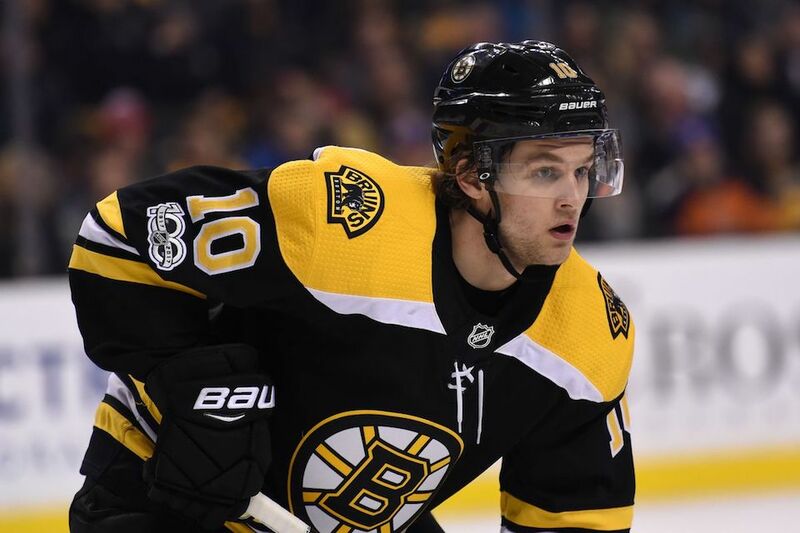 The Bruins youth movement unfortunately pinned some unrealistic expectations on the young goal scorer and he wasn’t able to meet them, causing many to prematurely label him a bust. Unfortunately, fans will never know how his season would have played out long-term given that he received a season ending shoulder surgery for an upper-body injury in mid-February. Hopefully, with some tempered expectations, the young winger will be able to bounce back in his sophomore season.